Baby Food, Cookies and Bars, HEALTHY! Homemade fig newtons recipe from scratch. 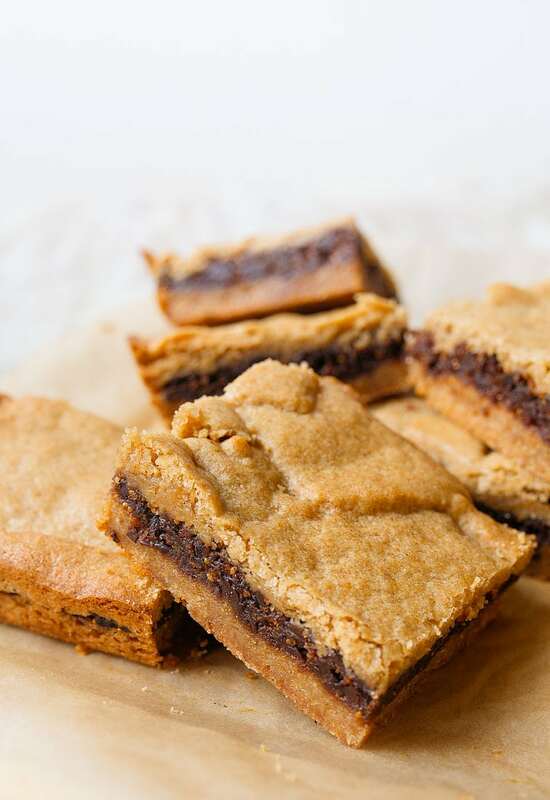 Fig newtons made in a bar instead of a rolled cookie-so much easier and they taste just the same! Words can hardly describe how much I love these. And I can sit here and tell you that they are approximately 1-million times better than the store-bought ones, but you won’t believe me until you try them. I get it. It’s my job to bake things and tell you how amazing they are. I do my best to convince you to bake what I bake. It probably falls on deaf ears after 718 recipes on this site. But, I will say it again: these cookies are definite must-makes. When you steep dried figs in apple juice (or water + a squeeze of honey) and then puree them, the filling is more flavorful and moist than store-bought fig newtons. It’s not jammy and thick like store-bought, it’s fruity and soft. The crust is an identical copy of store-bought, but here’s the thing: after sitting out uncovered for 1 day, the crust develops a thin layer of crispiness on top. And it’s addictive. They are made with a small amount of whole wheat flour. In my book, any time whole grains are involved, a dessert is instantly healthy and therefore guilt-free. And yes, you can use this information to justify a homemade fig newton binge or a homemade graham cracker binge alike. I have to be honest, guys. There is a short list of recipes on this site that I’ve made more than a dozen times. A few are: my 15-minute homemade puff pastry, quick no-yeast cinnamon rolls, ricotta gnocchi, wine slushies, and melting sweet potatoes. 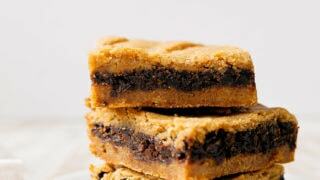 But these homemade fig newtons? I made them the second I arrived in Dallas at my parents house. I need lots of people to make these and confer with me that they are, in fact, delicious & better than the original. Please hold some back and eat them on day 2 to taste the crisp crust. Just do it for me. But it’s okay, because I saw the adults clean up the leftovers. 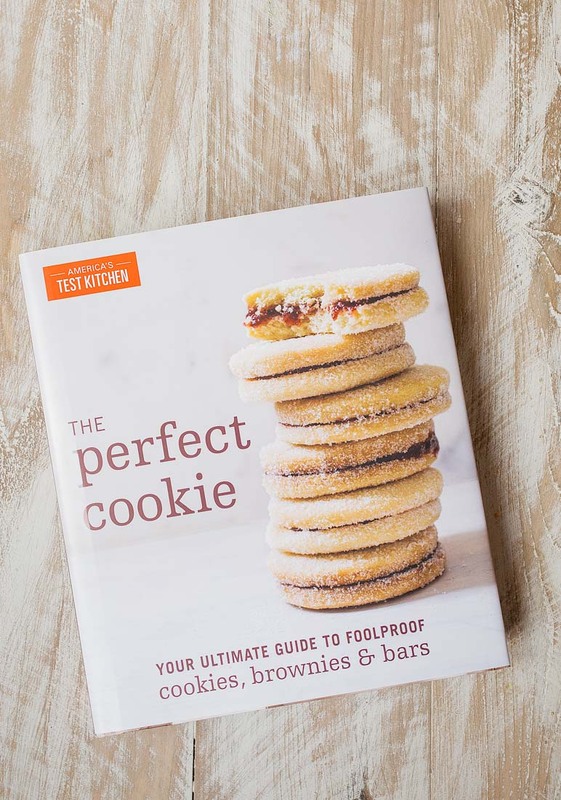 I made this recipe from America’s Test Kitchen’s new cookbook: The Perfect Cookie. I really love this new cookbook of theirs, and I will be baking from it all holiday-season long! America’s Test Kitchen is the place I send people for fail-proof recipes. If you’re not familiar with America’s Test Kitchen (or, ATK as I call them), their recipes are some of the best tested, written, and scientifically-researched recipes out there. And that just makes the baking nerd in me so happy. I own so many of their books, that they have a dedicated shelf in my cookbook library. Homemade fig newtons made with dried figs and a whole wheat brown sugar crust. Even better than store-bought! FOR THE FILLING: Simmer the figs, apple juice*, and salt in a medium saucepan over medium heat, stirring occasionally, until the figs are very soft and the juice is syrupy, 25 to 30 minutes. There should only be 3-4 tablespoons of liquid remaining in the pan when they're done. Let the mixture cool slightly. Puree the figs in a food processor with the lemon juice until the mixture has a thick jam consistency, about 8 seconds. FOR THE CRUST: Adjust an oven rack to the middle position and heat the oven to 350 degrees. Line an 8-inch square baking pan with a parchment both directions, and then grease the paper. Whisk the flours, baking powder, and salt together in a medium bowl. In a large bowl, beat the butter and sugar together with an electric mixer on medium speed until light and fluffy, 3 to 6 minutes. Stir in the flour mixture until just incorporated. Reserve 3?4 cup of the dough for the topping! Sprinkle the remaining dough mixture into the prepared pan and press into an even layer with a greased spatula. Bake the crust until just beginning to turn golden, about 20 minutes. 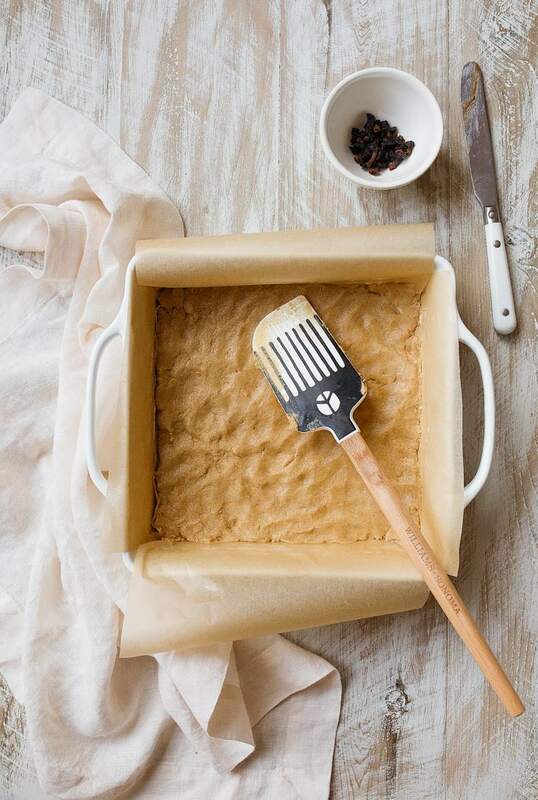 Meanwhile, roll the reserved 3/4 cup of dough for the top crust between 2 sheets of greased parchment paper into an 8-inch square; trim the edges of the dough as needed to measure exactly 8 inches. Leaving the dough sandwiched between the parchment, transfer it to a baking sheet and place it in the freezer until needed. Spread the fig mixture evenly over the crust. Unwrap the frozen, reserved top crust and lay it over the filling, pressing lightly to adhere. Honestly, this part doesn't have to be perfect; you can see in the photos I had some tears and holes and I just patched it. Once you cut the bars, no one will notice! Bake the bars until the top crust is golden brown, 25 to 30 minutes, rotating the pan halfway through baking. Let the fig bars cool completely in the pan, set on a wire rack, about 2 hours. Remove the bars from the pan using the foil, cut into squares, and serve. *If you lack apple juice, you can use water with 1 tablespoon of honey added. These sound SO GOOD! One question – do you think you could use black mission figs instead? Absolutely! I just made another batch today with Mission figs, and they’re great! Oh yay! I’m doing it! Hi. I can’t wait to try these because I know they are going to be superb. I’m drooling already. Thank you. I just made these and they are AMAZING. You hit it out of the park with this one. Can’t wait to bake these all winter! I made your fig newtons for a family breakfast last weekend and they were a hit. My one-year old has baby bronchitis and didn’t eat anything all day except for the fig newtons for dinner. Thank you! Hi, I loooooove Fig Newtons! I’m gluten free, do you think using Bob’s Red Mill 1 for 1 flour would work ok? Yum!! I’ve been waiting since you wrote this post for my grocery store to get dried figs in again (they always seem to get bought before I get there), and they were totally worth the wait! I’m glad I bought double the amount of figs I’d need because I know we’re going to want another batch very soon. :) I forgot it needed whole wheat flour so I just made them with all purpose flour instead and they still came out great. Definitely getting the whole wheat flour for the next batch though! Thanks for sharing this great recipe! Yay! So glad you loved them, Monica! SO, so good! I love fig newtons but these were a million times better. Sorry I didn’t make a double batch. Thanks for the recipe, it’s a keeper! Hello would about fresh figs or fig jam could either one of these be used. Hi! I’ve only tried the recipe the way it is written. Not sure if fresh figs would work. Fig jam might! My mom doesn’t like fig newtons and she liked these! Thanks for sharing. 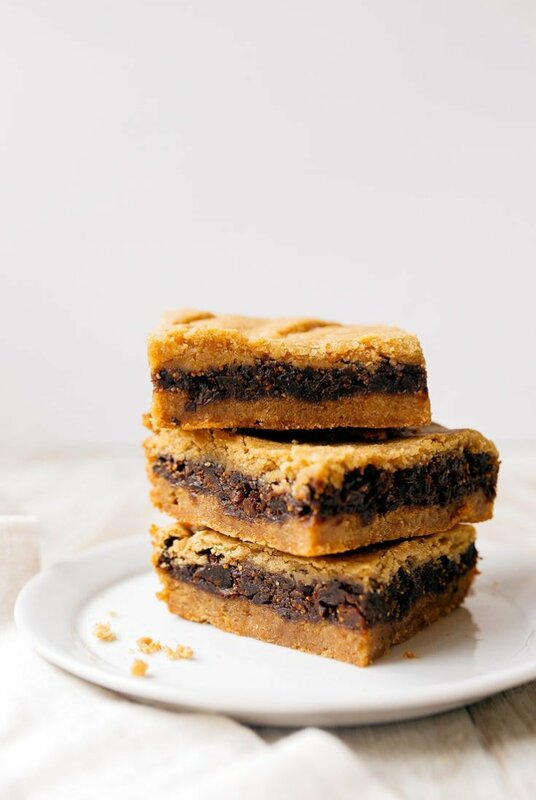 Do yourself a favor and double the recipe into a 9×13. Even if this is a recipe for two, you’ll want more! The second time I made them, I subbed dried cherries for the half of the figs. Wowzas. Oh my goodness my Husband loves Fig Newtons this is a must try , I just bought him 4 packs from the store…lol if these are better the store boight is going back !! Thank you for your sincere dedication and wonderful Recipes … I’m so waiting for you to come to Alabama for a book signing !! Don’t have apple juice or honey.. Do you think that I could use maple syrup and water? I think so! They will have a slight maple flavor, but the recipe will still work. It won’t have the characteristic fig newton flavor, maybe. Do you have a recipe using fresh figs; when they are in season it’s a must to use them up! Hi! This recipe sounds awesome! Would fresh fig that has already been cooked work? We have several fig trees and as soon as we pick a large batch we cook them. Now there’s several containers of this in the freezer that still need to be used up. 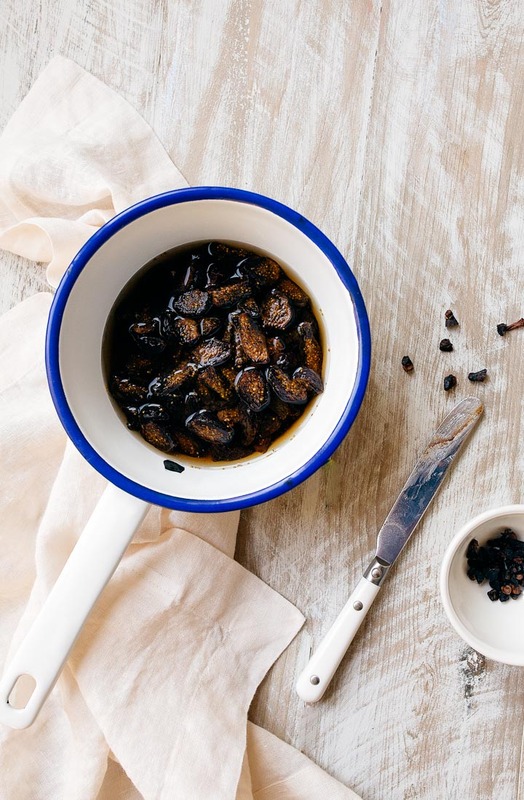 Do you think that could work instead of the dried fig that you steeped? Hmm…did you cook them down already? I think it might work, though fresh figs are going to have more moisture than dried. Maybe skip the rehydrating step, and cook the fresh figs down into a paste first? Ok so if I’m on a 2500 calorie diet ONE fig Newton would blow the whole days diet right out of the water at over 2600 calories per serving. I honestly can say right off the top of my head I can not think of anything that has a days worth of calories in one serving. Mental note to self don’t touch the fig newtons. Hold up, Tella. It’s 2600 for the entire pan, not one fig newton. My nutrition calculator is set for the whole dessert.